Just across the Charles River from Boston is the city of Cambridge, home to some of the top schools and universities in the country. Filled with parks and other recreational facilities, ample time in Cambridge is spent outdoors playing sports or enjoying the scenic views. Natural grass takes considerable time and resources to maintain properly and making the switch to synthetic turf will reduce that. Located in nearby Woburn, Turf Prep is proud to provide synthetic turf installation and maintenance services in the city of Cambridge and the surrounding area. Making sure your synthetic turf is properly installed and maintained is critical to keeping users safe. When we install synthetic grass, we perform tests to ensure each component is working, from the rubber infill to the shock absorbency layer underneath. Working with a professional team will make sure your field is built to last as long as possible. If you are interested in having synthetic grass installed in your yard, park or athletic facility, contact Turf Prep today! 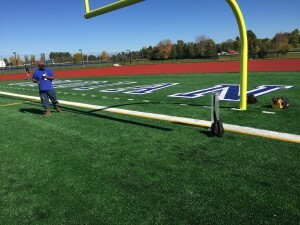 We work across New England and continue working on your turf long after installation, offering annual maintenance plans with several on-site visits to conduct safety testing, infill redistribution, and paint touchups. To schedule a consultation or a free estimate, contact Turf Prep by calling 1-877-744-TURF or by filling out our online contact form.